Three day cruise - Weston to Ilfracombe. Thankfully I'd made a definite arrangement with Ian for the three days - and amazingly, with the weather we've had of late, caught the tail end of this balmy fine high pressure. Stayed aboard the boat Tues night for an early off - 2 hrs before HW Wed. Ended up away down the river at 6.40. Overcast, but very still and warm. Ian reckoned we could make Ilfracombe by the LW - but I'd my doubts. I had be informed that after Foreland Point, you can cut inshore and miss any adverse tidal stream for the last 6 or 8 miles. Anyhow - it was a still and calm morning, but a big spring tide of 12m at Weston - so we would have a significant push along. Somewhere off of Minehead here - motored all way for the first two hours against the last of the flood tide. Once the fair tide started we would get the speed we needed. 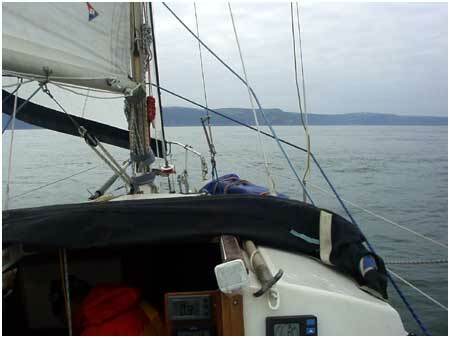 It really was hardly worth having the sails set at all and we ended up motoring for at least five hours. Well past Foreland Point at slack water - and really should have gone in much closer - we realised that on the morrow. Lower pic is just to convince you that we do wear harnesses, even in calm weather, and we do have charts and we do occasionally look at them ! Somewhere near Foreland Point I think - last of the tide giving us about 3.9 over the ground - hardly a kt from the light air. 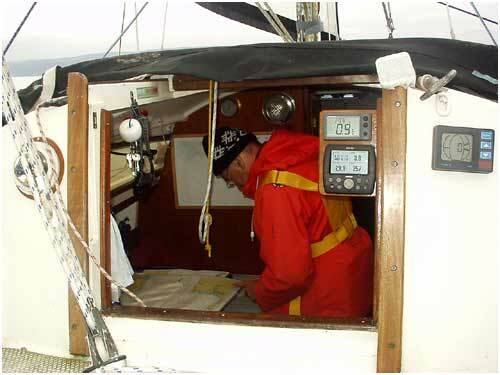 We were nearing Copperas Rock by slack water. Saw a large should of dolphins around here - but they were very briefly showing - certainly were off somewhere more interesting to dolphin tastes !